Critics of the monuments held their own rally, in support of reductions, in Monticello. (Chris Detrick | The Salt Lake Tribune) Supporters of the Bears Ears and Grand Staircase-Escalante National Monuments rally at the Utah State Capitol Saturday, December 2, 2017. Utah Highway Patrol estimated 5,000 people attended the rally. (Chris Detrick | The Salt Lake Tribune) Supporters of the Bears Ears and Grand Staircase-Escalante National Monuments rally at the Utah State Capitol Saturday, December 2, 2017. Utah Highway Patrol estimated 5,000 people attended the rally. (Chris Detrick | The Salt Lake Tribune) Supporters of the Bears Ears and Grand Staircase-Escalante National Monuments rally at the Utah State Capitol Saturday, December 2, 2017. Utah Highway Patrol estimated 5,000 people attended the rally. (Chris Detrick | The Salt Lake Tribune) Supporters of the Bears Ears and Grand Staircase-Escalante National Monuments rally at the Utah State Capitol Saturday, December 2, 2017. Utah Highway Patrol estimated 5,000 people attended the rally. (Chris Detrick | The Salt Lake Tribune) Supporters of the Bears Ears and Grand Staircase-Escalante National Monuments rally at the Utah State Capitol Saturday, December 2, 2017. Utah Highway Patrol estimated 5,000 people attended the rally. (Chris Detrick | The Salt Lake Tribune) Supporters of the Bears Ears and Grand Staircase-Escalante National Monuments rally at the Utah State Capitol Wednesday, February 24, 2016. (Chris Detrick | The Salt Lake Tribune) Supporters of the Bears Ears and Grand Staircase-Escalante National Monuments rally at the Utah State Capitol Saturday, December 2, 2017. Utah Highway Patrol estimated 5,000 people attended the rally. (Chris Detrick | The Salt Lake Tribune) Supporters of the Bears Ears and Grand Staircase-Escalante National Monuments rally at the Utah State Capitol Saturday, December 2, 2017. (Chris Detrick | The Salt Lake Tribune) Supporters of the Bears Ears and Grand Staircase-Escalante National Monuments rally at the Utah State Capitol Wednesday, February 24, 2016. (Chris Detrick | The Salt Lake Tribune) Supporters of the Bears Ears and Grand Staircase-Escalante National Monuments rally at the Utah State Capitol Wednesday, February 24, 2016. (Chris Detrick | The Salt Lake Tribune) Supporters of the Bears Ears and Grand Staircase-Escalante National Monuments rally at the Utah State Capitol Saturday, December 2, 2017. (Chris Detrick | The Salt Lake Tribune) Supporters of the Bears Ears and Grand Staircase-Escalante National Monuments rally at the Utah State Capitol Saturday, December 2, 2017. (Chris Detrick | The Salt Lake Tribune) Supporters of the Bears Ears and Grand Staircase-Escalante National Monuments rally at the Utah State Capitol Saturday, December 2, 2017. Utah Highway Patrol estimated 5,000 people attended the rally. (Chris Detrick | The Salt Lake Tribune) Navajo Nation Attorney General Ethel Branch speaks during a rally at the Utah State Capitol Saturday, December 2, 2017. Utah Highway Patrol estimated 5,000 people attended the rally. (Chris Detrick | The Salt Lake Tribune) Robbie Bond, 10-year-old founder of Kids Speak for Parks, speaks during the rally at the Utah State Capitol Saturday, December 2, 2017. Utah Highway Patrol estimated 5,000 people attended the rally. (Chris Detrick | The Salt Lake Tribune) Robbie Bond, 10-year-old founder of Kids Speak for Parks, speaks during the rally at the Utah State Capitol Saturday, December 2, 2017. Utah Highway Patrol estimated 5,000 people attended the rally. (Chris Detrick | The Salt Lake Tribune) Supporters of the Bears Ears and Grand Staircase-Escalante National Monuments rally at the Utah State Capitol Saturday, December 2, 2017. Utah Highway Patrol estimated 5,000 people attended the rally. (Chris Detrick | The Salt Lake Tribune) Supporters of the Bears Ears and Grand Staircase-Escalante National Monuments rally at the Utah State Capitol Saturday, December 2, 2017. Utah Highway Patrol estimated 5,000 people attended the rally. (Chris Detrick | The Salt Lake Tribune) Navajo Nation Attorney General Ethel Branch speaks during a rally at the Utah State Capitol Saturday, December 2, 2017. Utah Highway Patrol estimated 5,000 people attended the rally. (Chris Detrick | The Salt Lake Tribune) Supporters of the Bears Ears and Grand Staircase-Escalante National Monuments rally at the Utah State Capitol Saturday, December 2, 2017. Utah Highway Patrol estimated 5,000 people attended the rally. (Chris Detrick | The Salt Lake Tribune) Supporters of the Bears Ears and Grand Staircase-Escalante National Monuments rally at the Utah State Capitol Saturday, December 2, 2017. Utah Highway Patrol estimated 5,000 people attended the rally. (Chris Detrick | The Salt Lake Tribune) Supporters of the Bears Ears and Grand Staircase-Escalante National Monuments rally at the Utah State Capitol Saturday, December 2, 2017. Utah Highway Patrol estimated 5,000 people attended the rally. (Chris Detrick | The Salt Lake Tribune) Supporters of the Bears Ears and Grand Staircase-Escalante National Monuments rally at the Utah State Capitol Saturday, December 2, 2017. Utah Highway Patrol estimated 5,000 people attended the rally. (Chris Detrick | The Salt Lake Tribune) Supporters of the Bears Ears and Grand Staircase-Escalante National Monuments rally at the Utah State Capitol Saturday, December 2, 2017. Utah Highway Patrol estimated 5,000 people attended the rally. (Chris Detrick | The Salt Lake Tribune) Supporters of the Bears Ears and Grand Staircase-Escalante National Monuments rally at the Utah State Capitol Saturday, December 2, 2017. Utah Highway Patrol estimated 5,000 people attended the rally. (Chris Detrick | The Salt Lake Tribune) Supporters of the Bears Ears and Grand Staircase-Escalante National Monuments rally at the Utah State Capitol Saturday, December 2, 2017. Utah Highway Patrol estimated 5,000 people attended the rally. (Chris Detrick | The Salt Lake Tribune) Supporters of the Bears Ears and Grand Staircase-Escalante National Monuments rally at the Utah State Capitol Saturday, December 2, 2017. Utah Highway Patrol estimated 5,000 people attended the rally. (Chris Detrick | The Salt Lake Tribune) Supporters of the Bears Ears and Grand Staircase-Escalante National Monuments rally at the Utah State Capitol Saturday, December 2, 2017. Utah Highway Patrol estimated 5,000 people attended the rally. (Chris Detrick | The Salt Lake Tribune) Supporters of the Bears Ears and Grand Staircase-Escalante National Monuments rally at the Utah State Capitol Saturday, December 2, 2017. Utah Highway Patrol estimated 5,000 people attended the rally. (Chris Detrick | The Salt Lake Tribune) Supporters of the Bears Ears and Grand Staircase-Escalante National Monuments rally at the Utah State Capitol Saturday, December 2, 2017. Utah Highway Patrol estimated 5,000 people attended the rally. 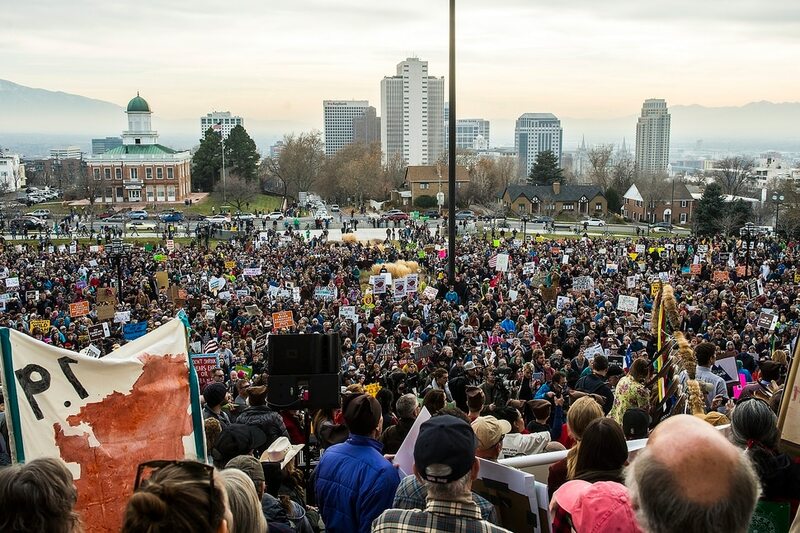 Thousands of Utahns filled the steps, sidewalks and lawns outside the state Capitol on Saturday, protesting imminent action by President Donald Trump to drastically reduce the size of the Bears Ears and Grand Staircase-Escalante national monuments. Speakers, including tribal leaders, questioned the politics and legality of shrinking the two monuments. They stressed the value of protecting the lands, which include archaeological and cultural sites considered sacred by indigenous peoples, diverse plant and animal life, recreational and scenic attractions, and undeveloped energy reserves. 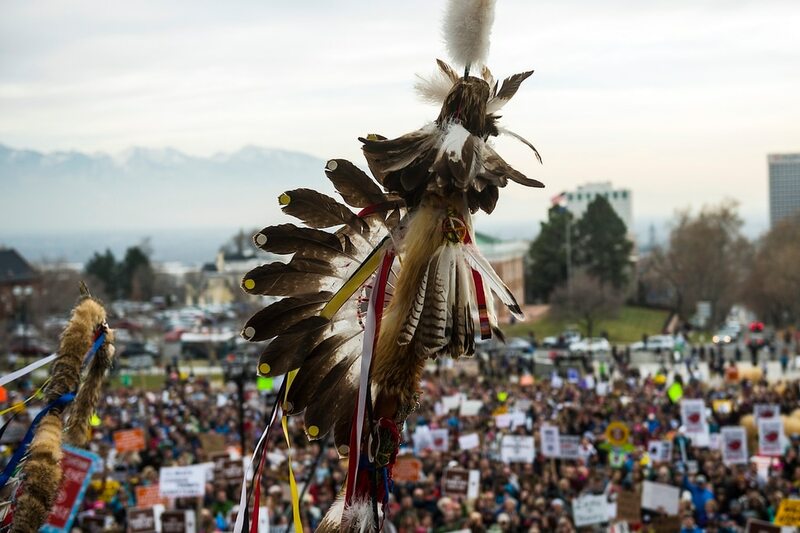 About 5,000 people attended the rally, according to Utah Highway Patrol estimates. The event was held in response to a planned visit by President Donald Trump to the Beehive State on Monday, when Trump is expected to announce alterations to the size and makeup of the Bears Ears and Grand Staircase monuments, which were designated by former Presidents Barack Obama and Bill Clinton, respectively. Documents obtained by The Washington Post suggest that Bears Ears will be reduced by 85 percent, from 1.35 million acres to 201,397 acres, while Grand Staircase-Escalante will be halved from nearly 1.9 million acres to 997,490 acres. Obama’s designation of Bears Ears followed lobbying by a coalition of American Indian tribes. Leaders of the coalition have pledged to challenge any monument reduction in court. Critics of the monuments who support Trump’s planned reductions held a rally Saturday in Monticello. Speakers included several rural county commissioners and council members, as well as state Sen. Dave Hinkins, R-Orangeville, according to press materials. Bruce Adams, chairman of the San Juan County Commission, described the Monticello event as a “heck of a celebration” and one of the best days in county history. Adams said he welcomes the tourism that a monument can generate and recognizes the value of preserving areas of historical and cultural value. But that should be accomplished, he said, with the smallest acreage possible and with input from local communities, which were lacking in Obama and Clinton’s monument designations. In addition to reductions, Bears Ears and Grand Staircase-Escalante will likely be segmented into new, noncontiguous sites, leaked maps show. Those sites exclude a number of notable, previously protected areas, including the Kaiparowits Plateau and Cedar Mesa. The president, Arent said, is ignoring history, science and the benefits of a tourism economy to the communities around the monument. “Most local residents don’t want to see their scenic and sacred treasures dug up and plundered for profit,” she said. Christa Sadler, a geologist and author, said it is impossible to cherry-pick the most important areas within Grand Staircase-Escalante because the entire 1.9 million-acre monument is rich in scientifically valuable plants, fossils and geology. Trump is expected to meet with leaders of The Church of Jesus Christ of Latter-day Saints at Welfare Square before announcing his monument actions at the state Capitol. 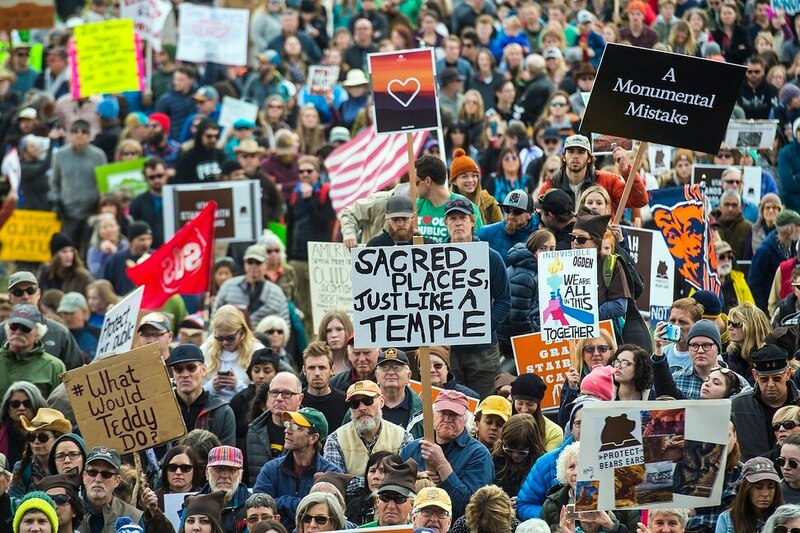 Additional rallies — in support of and opposition to the monument reductions — are planned to coincide with his visit to the Beehive State. Members of Utah’s federal delegation have vocally opposed the Bears Ears designation, and state lawmakers approved twin resolutions earlier this year urging the rescission and modification of Bears Ears National Monument and Grand Staircase-Escalante National Monument, respectively. Sen. Orrin Hatch, R-Utah, has described Obama’s designation as a “federal land grab” and lobbied Trump and Interior Secretary Ryan Zinke to reconsider Utah’s monuments. On Thursday, Hatch released a video thanking Trump for accepting his invitation to the state.